Grady et al. (1999) published some examples for applications of the ASM 1. It is necessary to first determine values for all 19 coefficients compiled in Table 11.5. Some of them have been chosen from mean values from many kinetic measurements; some of them are still unreliable. 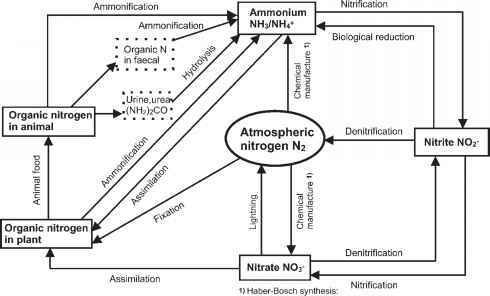 The processes 6 (ammonification of soluble organic nitrogen) and 8 (hydrolysis of entrapped organic nitrogen) are neglected. In addition to the parameters in Table 11.5, some characteristics of a domestic wastewater following primary sedimentation were considered (Table 11.6). A large number of questions can be answered using this model. One interesting question is: what is the oxygen requirement QG Ac°2 in dependence on sludge retention time tRX? The model was calculated for a steady-state condition and XA + XH; and then XH and QG Ac°2 were both plotted versus sludge age (Fig. 11.3). Table 11.5 Typical parameter values at neutral pH and 20 °C for domestic wastewater (Grady et al. 1999, p. 199). primary sedimentation (Grady et al. 1999, p. 214; Bidstrup and Grady 1988). Fig. 11.3 Effect of sludge age tRX on bacterial concentration XH and XH + XA as well as oxygen demand in a CSTR with tRX/tR = 20. Parameter values given in Tables 11.5 and 11.6. c' = 4.0 mg L-1 (Grady et al. 1999, p. 214). 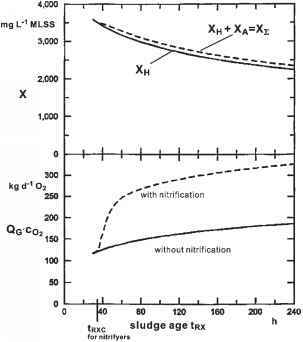 where Qex is the excess sludge flow rate (m3 d-1) and XR is the concentration of excess sludge (kg m-3). For a sludge age of tRX < 35 h, the nitrifiers are washed out. Their growth rate is too low compared with their dilution time in the system consisting of reactor and secondary clarifier. For tRX> 148 h = 7 d, the oxygen demand increases mainly as a result of endogenous respiration; nitrogen and carbon are removed to a greater extent.